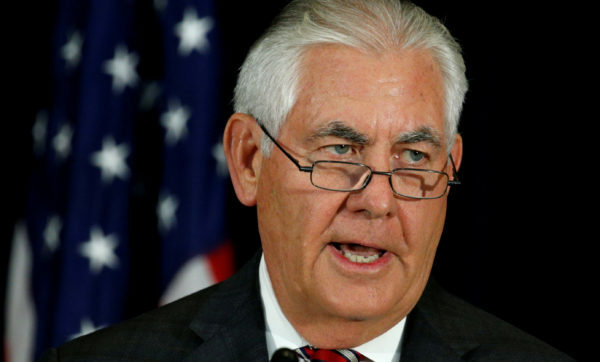 U.S. Secretary of State Rex Tillerson speaks during a press conference after talks with Chinese diplomatic and defense chiefs at the State Department in Washington, June 21, 2017. Secretary of State Rex Tillerson Wednesday morning defended President Donald Trump’s reckless threat to rain “fire and fury” on North Korea, but make no mistake: In the course of doing so, Tillerson quietly erased the red line that Trump laid down, and redrew it in a relatively more reasonable place. In other words, Trump clearly stated — twice — that any further threats from North Korea would be met with a response that dwarfs any show of military power ever seen in human history, including, presumably, America’s dropping of nuclear bombs on Japan. Anything Trump does, or threatens to do, will be bigger and stronger than what came before it, including the nuclear annihilation of millions. As many have already observed, by vaguely vowing an overwhelming nuclear response to continued threats from North Korea, Trump sounded a lot like North Korea itself, employing a formulation that is both vague and menacing, which in combination increases the risk of miscalculation and, with it, unspeakable horror. Tillerson plainly tried to undo that Wednesday by redrawing the line more sharply, while defending the impulse behind Trump’s comments. But that still leaves us guessing in a way that raises worrisome unknowns about what’s to come. We don’t know what Trump really meant. What has now been confirmed, however, is that Trump will use vague and reckless language in the most dangerous conceivable contexts. “No administration is of one mind on anything, so process determines how different preferences are aggregated together in presidential statements,” Lewis said. “Trump doesn’t choose words with any care whatsoever. If you don’t understand the process, you’re not going to understand what’s been agreed to … by broad inter-agency agreement.” Or if there was any such process at all. Greg Sargent writes The Plum Line blog for The Washington Post, offering opinion with a liberal slant.